After a couple of weeks after declaring my New Year's Goals to the world, I'm delighted to report that I've made some progress! Yesterday, I finished the first draft of my third novel. It's hard to believe but it's true. And I'm two weeks ahead of schedule. There's still months of editing and revising in front of me but that doesn't take away from the awesome-ness of getting the first draft down. I can't believe that I've managed to write another one. It's crazy. I picked up this book a few weeks ago and am psyched to see what I can get out of it. 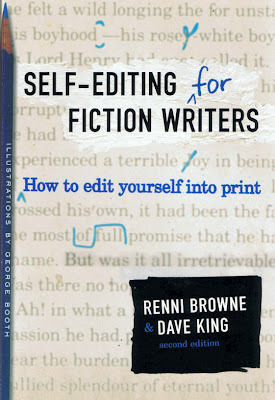 I liked it because the cover uses blue ink instead of red for the edits. I loathe the colour red (but understand that it has to exist because it's half of purple, the best colour on the planet). Plus, it got pretty solid reviews on Amazon. So far, I'm fifty pages deep and it's already given me some great tips on how to really "show" versus "tell." And they use excerpts from The Great Gatsby as examples. Loves. For today, though, I'm going to celebrate. Life's all about celebrating victories and completing the first draft of a 88,000-word novel is, in my opinion, a victory. Not like a needs-a-day-named-after-it kind of victory, but a victory nonetheless. Unless, of course, you INSIST on launching a Twitter campaign to have today designated as "Jennie Finished The First Draft of Her Third Novel Day." Don't let little old me stop you. Ha! Last week, I booked a massage for today, so that's super convenient as far as celebrating goes. I also think I'll treat myself to Subway for lunch. Maybe I'll even get cheese on my sandwich....it IS a celebration, after all. A delicious, cheesy celebration (with extra pickles). I had no idea that you had written novels before! I knew you were a writer but didnt realize it was novels. That is awesome!! What genre do you write!